Tirubaa Minipc Contains kindergarten to standerd 12th Nationally Aligned Audio Visual Syllabus For Mathematics & Evs In English. 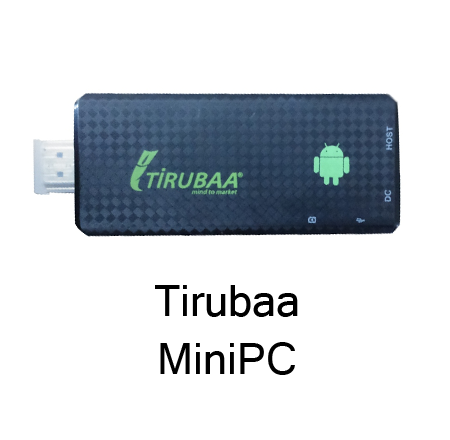 Poratable Android Based Minipc Is Hdmi Dongle Which Can Be Used To Convert Your Television Into A Smart Learning Tool. Also, Serves As External Computer For Projectors Which Are Without In-built Pc. Tirubaa Minipc Contains Std 1st Nationally Aligned Audio Visual Syllabus For Mathematics & Evs In English. Quad Core, Cotex-a9, Up To 1.6ghz, Mali-400 Mp4 Gpu, Android 4.2, Support Adobe Flash 11.0 Ddr3 2gb Nand Flash: 8gb (4gb Usable),support Mouse And Keyboard Via Usb Or 2.4ghz Wireless Mouse And Keyboard Via, 2.4ghz Usb Dongle.